clay and limestone: Wildflower Wednesday~Carolina Aster: Not Just Another Pinkish Face! Wildflower Wednesday~Carolina Aster: Not Just Another Pinkish Face! It Clambers, It Climbs! It's Fragrant! Need I say more to convince you to rush to your favorite on line native nursery to get this pretty! I must be honest~~I bet you're wondering what will follow! This is Carolina's first year at C&L! She has yet to be trialed in our wet winters. Which is the true test of most plants that move here. Can they survive wet clay soil for months on end? Regular visitors know that C&L plants have to be tough. This is one reason why there are so many cedar glade endemics in the garden (here for more on them). They are tough as nails; enduring wet winters and hot, dry summers. If these are your conditions, don't despair! Cedar glade endemics can take it! Austin gardeners, you ought to be able to grow them! Go here for ideas! But, I digress, the point is that Sweet Carolina is not a cedar glade endemic. Carolina Aster has been described as a woody scrambling shrub, so it might be one of those plants that looks equally good climbing on a wall or romping through the border. We'll see how it grows after the winter tests it! It was happily growing in containers at Growild Nursery. My hope is that it will continue to grow well here and reach toward the 12 feet size it's purported to grow. It's planted on a trellis against a southwest facing wall. A sunny and protected spot; the former home of Carolina Jessamine, which started to grow under the roof shingles and was moved to the wayback backyard's ugly cyclone fence, but that's another story! *A pretty little southeast coastal native, that might or might not survive the harsh growing conditions this garden likes to throw at plants! But, worth the trouble, if it climbs and scampers. We like climbing and scampering. *It will grow as far south as Zone 9 and with protection as far north as Zone 6. *While some garden centers claim it's tough as nails...It is by NO stretch of the imagination a xeric plant! *Like all asteraceae, it attracts many pollinators looking for nectar and pollen. 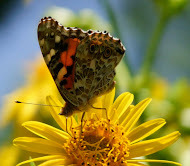 It's a caterpillar food plant for the American Painted Lady butterfly. *It has a sweet honey like fragrance. *Fall blooming until frost for all the bees and late visiting butterflies. That's all I know folks! But, doesn't she sound like she might be worth some trouble coddling! What a pretty aster...and that it is fragrant is such a bonus. I am not sure if we have it in our yard...how large is the blossom? I was noticing some kind of aster in the back part of our yard....growing through the bermuda. 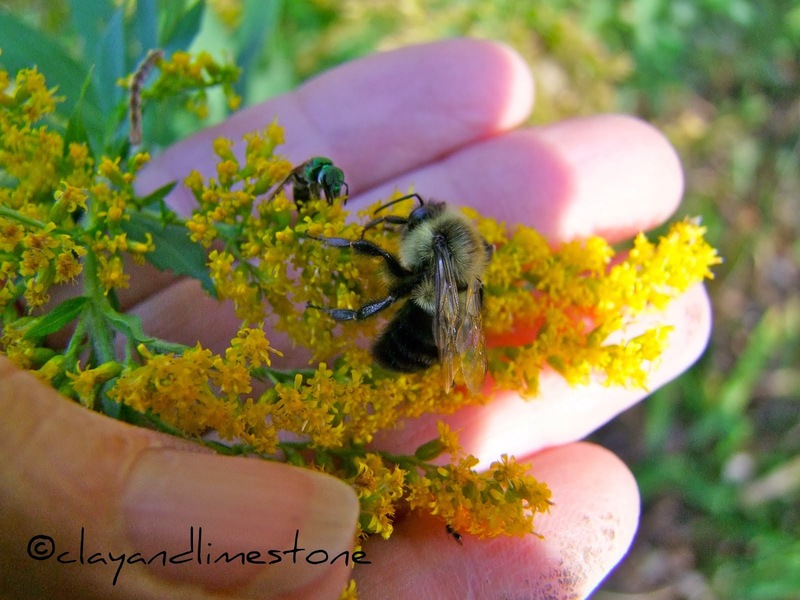 Love seeing this humble bumble still bumbling about your garden. Too cold here for the bumbles. This plant would probably not like it here. Too cold and wet during winter. It sounds great though. Gail, it's very pretty! I would love to find a climbing Aster here... and I do hope it will survive in your garden. Looking forward to more photos next year! I hope it comes back for you Gail. A climbing aster sounds so cool! and its flower head is unique. Thanks for introducing us to it. Good morning Gail. It certainly is a pretty plant. I hope it does well for you. Whoa, Gail, a climbing aster! Now I've seen everything. And I love the description as "a woody scrambling shrub." Sounds like it would do just fine here on the studio trellises! I enjoyed your photos. This looks like a great plant! I hope it is happy in your garden. I did not know Asters could climb, thanks for the plant info! Pretty neat! I'll echo Frances to see how it does in your garden first. There are probably all kinds of spots I could put it in on our hillside. Fabulous! What an amazing set of attributes! Who can have imagined?! Is the 12' for height or width! OMG! I can't believe ti's fragrant, how exciting!!! Good luck with the overwintering, hopefully tough as nails means exactly that! This may be one worth considering for sure! Hi Gail, Might I convince you to save seeds from this beauty for my seed swap (at least I think you said you were interested in participating... sorry if I'm misremembering!). What a beautiful color of aster! We have deep purple, white, and pink here in Michigan..They grow wild in my backyard, and some at the parks..
Carlina aster sure is adorably sweet and very asteraceae! Monica...I will save seeds! Frances, Dave et al, I don't mind testing this cutie pie out! Lzyjo, It will 12 feet tall however it chooses to grow...scrambling or climbing...we'll see! darla, This is a Florida native, you must get her. Joy, I am sorry to tease...I have to revel in what we can grow, there are so many more plants that northern gardens make happy, but southern gardens kill. Janet, I am guessing it would grow for you! Lisa, if the temperatures go over 50 the bumbles will be out~~we haven't had a killing frost....yet! Just put her on my plant list!! She's another beauty Gail. I hope she sails thru the winter at C&L so you can "litter" the landscape with her. I need to change zones I think! I'm with Joy -- although it might just just just be hardy here, if I had anywhere to offer it a place to "scand" and grow. I've grown it in upstate SC, and I used to grow it in suburban MD, in a warm micro-climate in zone 6b. Fabulous plant in both locations. Very pretty plant. It's just as well that I can't really have it here. A person just doesn't have room for EVERYthing! ;-) And it keeps your garden unique. Have a great day, Gail. A climbing Aster is a new one on me. It looks very pretty. Hope it survives the wet winter. Hi Gail....blessed are the bees....and doesn't she look beautiful on your lovely bloom. It's not fair to tease us in Zone 5 & colder with such a wonderful plant. You know I'm sucker for just about any Aster. Thank you for putting the widget on your sidebar and it looks so pretty there. It's going to help a lot of little kids have a bright holiday. This is a delicate little aster isn't it? It's the softest hint of lavender. I hope it will make in your garden. I've not had any luck at all with asters. Gail, There is a baby praying mantis on my Diet Pepsi bottle and I'm in the house. Odd isn't it? He's looking at me and me at him. I have been meaning to get this plant for years. The fragrance part seals the deal. :) If I can't get seeds from the NC Botanical Garden I'm going to get it from Niche. I'm guessing it will survive your winters, because I read somewhere that it's an aster that likes wet conditions. I love your Wildflower Wednesdays! A great choice! I've seen them growing everywhere except in my garden (rabbits love asters). Sweetbay, That is such good news...both the surviving here and that you are going to get a plant! it will love your boggy garden spots! I may be begging for a start of it from you in a few years! Glad, too, that you like WW...they are fun! She is so very pretty and fragrant? Hard to resist. Gail, beautiful color and I can see it climbing up my deck. It would be worth the trouble to protect it if that's what it took to get Carolina to grow here. Thanks for another delightful wildflower. 12' tall....Wow! Pretty flowers! All mine are gone except a couple of autumn crocus. Gail, so good to see the bees still in your garden! I hope this aster enjoys its new home at C&L; it would look great climbing up a trellis. And, no I didn't know what scandent meant, so thanks for adding to my gardening vocabulary! That is a cool plant! I've never heard of an aster getting so tall! I'm zone 5b, and once in awhile, I have zone 6 plants do OK. I'll be interested in seeing how yours does. Indeed she's a beauty (and so are you)! Wonderful! i love fragrant blooms,and i have been debating on which fall aster to plant outside! Gail, I finally have an opportunity to catch up on my blog reading and I'm so delighted to read this post! I saw this Aster at a nursery last weekend and was debating whether it was worth buying. I now know the answer and must hie myself out there again to get it!